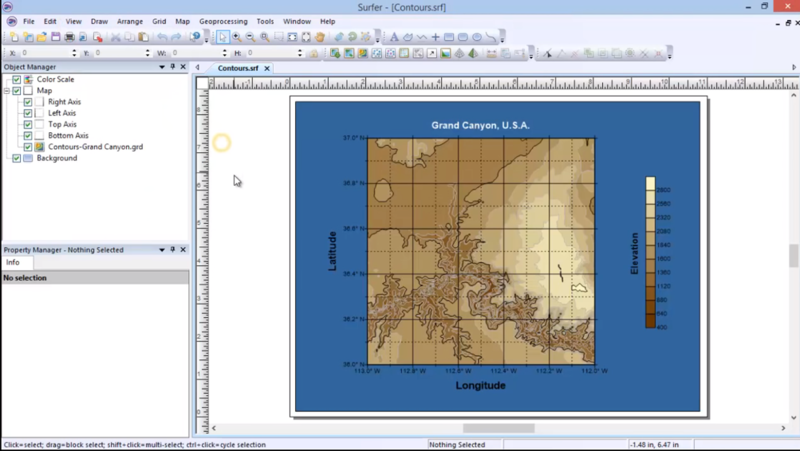 Surfer is a full-function contouring and surface modeling package that runs under Microsoft Windows. Surfer is used extensively for terrain modeling, bathymetric modeling, landscape visualization, surface analysis, contour mapping, watershed and 3D surface mapping, gridding, viewshed analysis, volumetrics, and much more. Surfer's sophisticated interpolation engine transforms your XYZ data into publication-quality maps. Surfer provides more gridding methods and more control over gridding parameters, including customized variograms, than any other software package on the market. You can also use grid files obtained from other sources, such as USGS DEM files or ESRI grid files. Display your grid as outstanding contour, 3D surface, 3D wireframe, watershed, vector, image, shaded relief, and viewshed maps. Add base maps to show boundaries and imagery, post maps to show point locations, and combine map types to create the most informative display possible. Virtually all aspects of your maps can be customized to produce exactly the presentation you want. Generating publication quality maps has never been quicker or easier.